Exhibitions serve a dual purpose of presenting art works to the community and offering a means of opening a conversation between the artist and the audience. Since its inaugural exhibition in 2003, San Diego Book Arts has presented 20 exhibitions in various locations in Southern California, including five national juried exhibitions and a traveling series of displays that visited community libraries throughout San Diego County. and here are a few photos from the opening. See Upcoming Events for details. 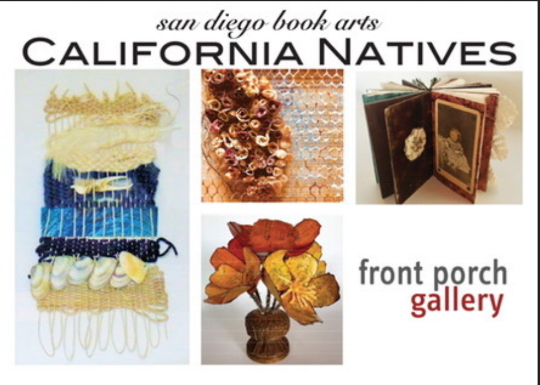 Celebrating art, creativity, book making and San Diego! The work will be on display January 8 - February 28, 2019. Note: Parking is free during the Opening Reception in Lot 10, which is closest to the Art Gallery. The most direct access is from Genesee Avenue onto Marlesta Drive and then enter the campus on the first right. Follow the entrance road to the right up the hill and around a curve to Lot 10. An Exhibit Catalog is available for sale. Over the Moon will be on display at Escondido Arts Partnership from April 7 to May 6, 2017. The original pages in their elegant clam shell will be shown along with other artist's books in an exhibition titled All About the Book, juried by SDBA member Viviana Lombrozo. Also showing will be works by SDBA members Yvonne Perez-Collins, Helen Shafer Garcia, Viviana Lombrozo and Barbara Ruys. The extraordinary exhibition of Over the Moon, a collaborative effort spanned 2 years and involved 40 SDBA book makers. Responding to a selection of haiku by SDBA member Diane Gage, the participating artists each created a unique page, which conformed to size, paper, and some content guidelines. These works were photographed, reduced, and printed, giving each member the materials to create a unique binding of the images. Original artwork was showcased as well as individual hand-bound artists' books. The exhibition had its inaugural showing at the Mission Valley Library from July 5 to September 29, 2016. For more information about Over the Moon, click here and scroll down the page. This fall 30 SDBA members showcased their work at the James Alan Rose Gallery of Frances Parker School in an exhibition titled If I Call It a Book. If I call it a book, does that mean it is a book? What makes it so? Does it need to have pages? And what, exactly, counts as a page? Is it a piece of paper or can it be a piece of glass? A board? A box? Some other found object? To be a book, must it have text? Does it need images? Must there be a narrative? The works in this exhibit reflected a plurality of contemporary methods and attitudes towards the question of what makes a book. Ultimately, a bookwork is judged by the vision it presents through its content, its physical presence, and how they interact to create meaning. Each of the artworks binds together ideas, images, and structure to present the artist’s unique perspective. At its core, the book arts movement is about making books by hand. Participating artists included Rhiannon Alpers, Elaine Antoniuk, Charlotte Bird, Britta Brice, Lark Burkhart, Linda Bussell, Judith Christensen, Mary Lynn Dominguez, Nancy L. Fisher, Gretchen Hiegel, Christina Larkin, Evelyn La Rosa, Viviana Lombrozo, Rhonda Luongo, Bhavna Mehta, Pamela Marrett, Laurel Moorhead, Yvonne Perez-Collins, Helen Petre, Gina Pisello, Kathy Przekopp, Janis Reeser, Al Rodriguez, Josie Rodriguez, Sibyl Rubottom, Barbara Ruys, Jim Stiven, Nancy Walter, and Shelley Watkins.